Point à Pitre is Guadeloupe’s biggest city. It is located on the southern edge of the thinnest part of the country and has a big harbor with a few anchorages. 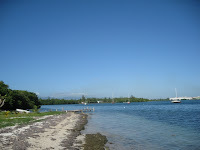 There is a marina area that is very convenient, clean and self-contained. You find marine shops, car rental places, a supermarket, expensive restaurants, and a chiropractor all in walking distance from the dinghy dock. The day after our arrival, “sore backed” Mark visited the chiropractor, who “cracked” him five times. The whole ordeal took less than five minutes and cost 60 euros. In the afternoon, we paid a brief visit to the city. The following two weeks, we basically stayed put in the harbor, to examine the developments of Mark’s back, work online and “wait for weather”. Mark spent hours on end improving the Wirie website, updating the manuals and preparing for our big launch of The “improved” Wirie. We were mainly anchored off a quiet island, Islet à Cochons, inhabited by little biting bugs. It was a good place to take Darwin to shore, except early in the morning or late in the afternoon. While the captain’s back was resting, the crew carried 70 gallons of water back on deck, filled the water tank, hauled the dinghy up the beach each time we took Darwin to shore and pulled it up our davits every night (a security matter). As good practice, the captain is steering the boat and the crew is lifting the anchor and the sails these days… Sometimes life on shore sounds appealing!